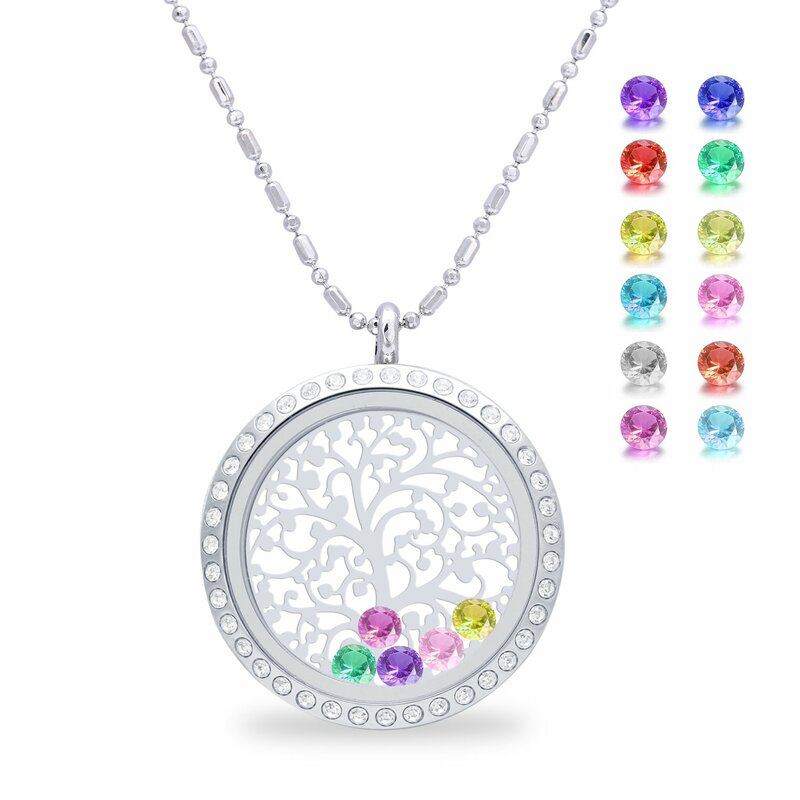 ♥Inheritance of love♥ -this family tree of life birthstone necklace is a special gift for your mom, grandma,mother-in-law, daughter, wife or nana, it represents the distance that may pass between family members, but how little this matters as you are (and always will be) part of the same family tree. Inside the floating living memory locket is a family tree of life plate and 12 birthstones charm, to represent how you are all still together as one. ♥Design concept♥ – This glass locket opens from the side like a notebook, and has a very strong magnetic open/closure with a pin, so you don’t have to ever worry about losing any of your treasured pieces. This also allows you to be able to open it up and add more charms, or switch out the pieces for a new look each day! Charms and disc will move around when worn, this is the nature of a floating locket. ♥Size:♥ Locket diameter: 30mm, Inside diameter: 23mm, Chain: 22″ + 2″ extra bead chain. ♥Material:♥ 316L stainless steel, Nature stainless steel color, Non plating, Non allergic, Non fade, Washable, Magnetic closure, Tempered glass. This may be the best necklace you have order! Family tree of life floating lockets can be a ideal present for anybody. It’s certainly an exceptional gift for the buddies, family, relatives, parent, and even to your someone special. Mother, Grandmother, Daughter, Wife, Girlfriend, Sister, Friend, Aunt, Mom, Mum, Anniversary, Grandma, Nana, Granny, niece, daughter in law gift, This necklace can be considered a kind of trend and style but additionally it may offer sentimental purposes. Family tree of life necklace can become a perfect present for all different specific occasion like Christmas Gift, Valentine’s Day Gift, Mother’s Day Gift, Birthday Gift, Wedding Anniversary Gift. Make someone happy by sending this marvelous gift to them. It may be about you and your style, handle it as one-of your most valued possession. It may be about your family or your relationship. Tell the story of your own life with the utilization of the fantastic charms and lockets and appreciate it with all of your heart’s content. When you believe durability, it is quite obvious that stainless steel outperforms either gold or silver. Stainless steel is not only a naturally hardy alloy (as it was created to be), but it is also an alloy that can handle a large number of wear and tear. This means that all through wearing jewelry that undergoes a large number of use (i.e. rings and bracelets), stainless steel jewelry will last quite a bit longer than its gold or silver counterparts. This is a bigger return on investment. Click the “Add to Cart” button at the top! Get ready to enjoy your new necklace like never before! ♥Inheritance of love♥ -this family tree of life birthstone necklace is a special gift for your mom, grandma,mother-in-law, daughter, wife or nana, it represents the distance that may pass between members of the family, but how little this matters as you are (and at all times will be) part of the same family tree. Inside the floating living memory locket is a family tree of life plate and 12 birthstones charm, to represent how you are all still together as one. ♥Design concept♥ – This glass locket opens from the side like a notebook, and has a very strong magnetic open/closure with a pin, so you don’t have to ever worry about losing any of your treasured pieces. This also allows you so that you can open it up and add more charms, or switch out the pieces for a new look every day! Charms and disc will move around when worn, this is the nature of a floating locket. ♥Quality and comfortable♥ – Stainless steel is significantly harder than gold, silver or platinum, it does not require fillers, so is at all times nickel and allergy metals free. jewelry grade stainless steel is more durable than other jewelry metals and and it is going to never tarnish, rust or wear off, and will last a life time! Shiny rhinestones surface and high polish creates glamorous reflections and adds a luxurious look to this necklace. ♥Service guarantee♥ – FEILAIGER jewelers strives to provide the best women jewelry and service for all our customers. and we provide a 100% satisfaction: 365 days free risk money back to give protection to you when you receive any defected order. welcome any test of our jewelry.